Recently, I've been prompted to do some research on heat stress because my EPM horse, Jazz, becomes noticeably symptomatic during the heat. Unlike most healthy horses, Jazz is very sensitive to heat stress. However, during my research, I've found that the extreme heat and humidity is potentially dangerous for all horses. Three-day eventers know that the most efficient way to cool off your horse is sponging (or hosing) with cold water, scraping the water off, and then repeating until your horse is cool. This has made a big difference in Jazz's life. For horses like mine with crappy hooves (technical term! ), simply oil the hooves before hosing. During extreme heat, walk out your horse, but then cool him or her down right away. Your horse's body will divert blood from the internal organs to the larger surface arteries and veins in order to try to dissipate heat and bring down the body's core temperature. Endurance riders and eventers know that in extreme cases, this can cause shock or contribute to organ failure. Folks down South will also hose their horses' legs, chests and necks, and between the hind legs, taking care to scrape off the excess, before tacking and riding. It's a pain, but it can significantly decrease fluid loss. Just yesterday, visiting-clinician Britta Johnston made the point that even if a horse makes it through a heat wave, the stress depresses the immune system and makes him or her susceptible to illness. So dealing with the heat isn't just a performance-related issue – it can affect your horse's health after the heat breaks. Because horses sweat out more electrolytes than humans, extreme sweating will negatively affect the "thirst trigger" mechanism. Horses, like humans, will feel thirsty when the electrolytes in their blood become more concentrated during fluid loss. However, if they lose too many electrolytes, the concentration doesn't reach adequate levels to trigger the thirst mechanism and they may naturally not want to drink after a workout, causing them to become dehydrated. Top dressing feed or giving electrolyte paste will activate your horse's thirst trigger. Some old-timers might tell you not to cold hose your horse's large muscles (i.e. hind end muscles) or the underside of the belly and to put a sheet on him or her to make sure the water doesn't evaporate too rapidly because both may cause tying up (cramping). Studies show neither to be the case. You want to cool your horse down as rapidly as possible. Tying up can be caused by many things, one of which are mineral (electrolyte) imbalance/depletion in the muscles, underscoring the importance of electrolyte replacement for the equine athlete. We all know it's not the heat, it's the humidity. 100-degree heat with very low humidity will not cause as much fluid loss as 85-degree weather with humidity in the 70%-range. HorseChannel.com published a useful measure, called the Heat Stress Index (HSI). Add the percentage humidity to the air temperature to get the HSI. [Ex: 91 degrees, with 50% humidity = HSI 141.] If the HSI is below 120, you have the green light to work your horse normally. Above 150, "particularly if humidity contributes to more than half of this number, your horse’s natural cooling mechanisms will be compromised," so modify your workout: lower the intensity or shorten the workout, or wait to ride after the temperature drops. 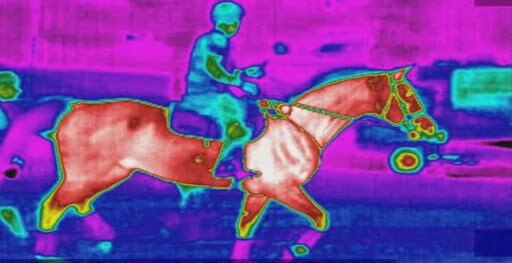 Above 180, your horse is unable to adequately manage his or her body temperature. I don't know how accurate this index is, but it is a useful guide. Naturally, horse owners with sensitive or older horses might want to consider lower HSI thresholds. If everyone's horse is sweating and yours isn't, take note  your horse may be prone to anhidrosis, which is a very serious, potentially life-threatening condition that inhibits his or her body's natural cooling mechanism. If you suspect this may be the case, consult with your vet. Even if your horse doesn't have anhidrosis, you must keep an eye on your horse's sweating. During a heat spell, your horse may already be mildly dehydrated and will not sweat as liberally as it would otherwise, causing your horse to overheat. In an article published by University of Guelph, Dr. Lindinger, DVM, makes the point that you need to acclimate your horse to working in the heat, especially if you plan on showing over the summer, but understand that this can be stressful for your horse and requires that owners adapt their horse-management practices to take rehydration and electrolyte mineral replacement into account. Horsechannel.com: Too Hot to Trot? Equisearch.com: Does Your Horse Need Electrolytes? Please add other links or offer your tips for keeping your horse cool in the comments section.